New Zealand regularly ranks highly in lists of the world’s top emigration destinations, with foreign nationals citing its spectacular natural beauty, excellent infrastructure, more laid back way of life and employment opportunities as some of its biggest attractions. Whatever made you pick New Zealand as your emigration destination of choice, you could counter one of the common hassles of a move overseas by letting TorFX manage your international currency payments and help you save thousands on your transfers. Excellent exchange rates and no transfer fees could see enjoy significant savings on larger transfers and TorFX can also help you budget for your emigration to New Zealand by letting you fix an exchange rate up to two years in advance of a trade. Opening an account with TorFX is free and comes with no obligation to trade. As a registered client you’ll be assigned a personal Account Manager, there to offer expert guidance and monitor your transfer through every stage. Additionally, you can sign up for free regular market updates covering the latest New Zealand Dollar exchange rate news. 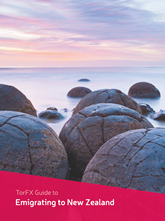 Thousands of families, young professionals and retirees have taken the plunge and made the move to New Zealand – if you’re planning to join them the money TorFX can help you save could make your emigration that bit easier.